Nothing makes me happier then hearing my husband say a dish is good with out any prompting. Most of the time I wait for him to take the first bite of a new recipe and stare at him intently waiting for response. After I got myself a bowl of this delicious new pasta creation and walked to my spot on the couch in the living room. I hear a very mouthful muffled "This is really good" from my husband. I secretly did this on the inside. 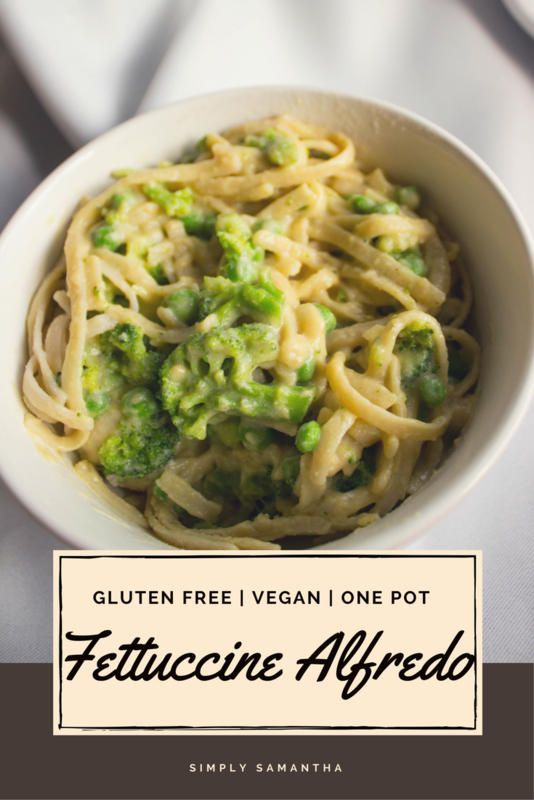 So if you are looking for a good dairy free pasta recipe that a dairy eating husband will enjoy this is for you! 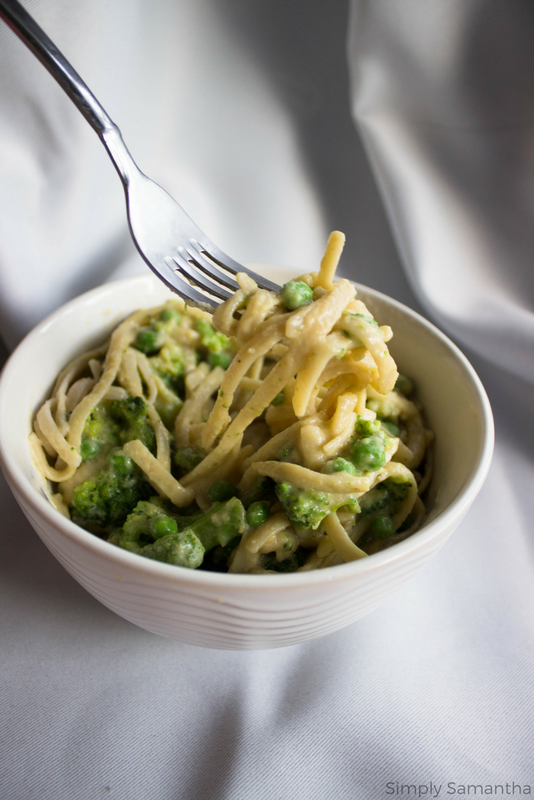 I know I've made Alfredo sauce (not once but twice) and pasta in the past but I feel this is BY FAR the easiest to make. 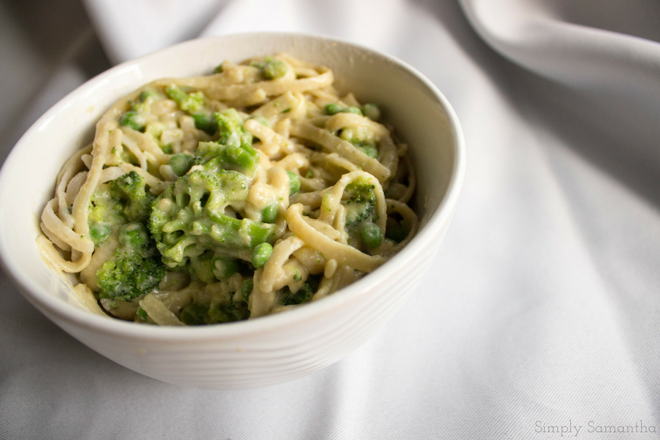 The best dairy free pasta you will ever make! In a pot (or pan) big enough for your pasta, saute garlic in butter, oil and a sprinkle of salt until the garlic is fragrant and the butter is melted. Next, pour in the veggie broth, soy milk, and the rest of the seasoning (GP,OP,S&P, and Nooch). Cover and bring to a boil.Once at a boil, turn the heat down and add the pasta. Push pasta down so its submerged in the liquid.The pasta will absorb the liquid. Gluten Free past is funny so if you feel you need more pasta, add more. Stir often with tongs so the noddles don't stick together. After about 10-15 minutes, add in frozen peas. If you need more liquid add soy milk.Once peas are soft, you can add in steamed broccoli with some garlic salt for flavor. Serve and enjoy! *I used Earth Balance **Soy milk works the BEST. I wouldn't suggest anything else. I used unsweetened Silk Soy Milk. ***I used about a box and half of Deboles GF pasta. Hence the 12oz. I made the leftovers noodles I didn't use in a separate pot just incase we needed more.